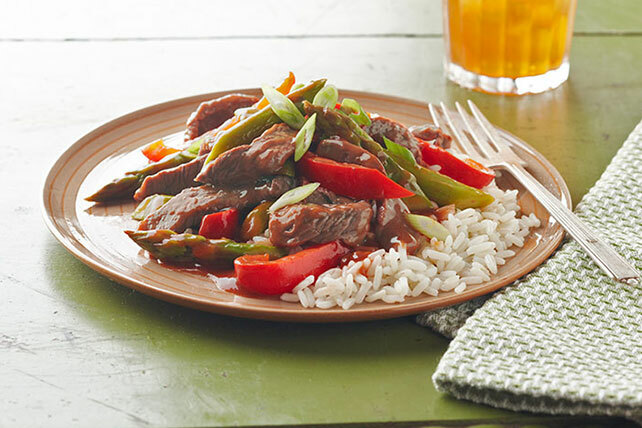 Get a thumbs up all around when you follow this Saucy Pepper Steak Recipe! Fry up juicy steak with fresh veggies for a tasty, colorful dish! Cook and stir vegetables in large nonstick skillet on medium-high heat 6 to 8 min. or until crisp-tender. Spoon into large bowl; cover to keep warm. Add meat, garlic and black pepper to skillet; cook and stir 3 min. or until meat is done. Stir in soy sauce; cook 1 min. Stir in barbecue sauce; cook 2 to 3 min. or until heated through, stirring frequently. Add to vegetables; mix lightly. Cutting boards, knives, plates and other utensils which come in contact with raw meat should be cleaned thoroughly with hot soapy water before being used for another purpose. Substitute a second red or green pepper for the yellow pepper.